Can you guess what day I wore this on? Hint: I'm wearing red (earrings) and green (earrings & blazer). I was in the holiday spirit when I dressed on Christmas. I don't have a lot of reds and greens in my closet but there is a lot of brown. Le boring. The brown tunic I'm wearing is from the Gap. It was $2.50. Since I have a die hard love for tunics, I couldn't pass it up. It's really comfortable and nursing friendly. The pattern is nice too. I've worn the jacket before here. I adore it. It set off my new found love of the color green. The boots are also a repeat. They are really comfortable. They are hard to take off though. No zippers so I have to do a lot of yanking to free my foot. I still love them for the wedge. The vintage coat has also made an appearance here but not with my fabulous H&M faux fur stole. Isn't it fun? I didn't have it on very long because we had really mild temps on Christmas. I was too hot baking in it. We'll have really cold temps soon and I'll be bundled up in a North Face. I have to find some alternative ways of wearing it. With a Sweater? Blazer? I love it when I check the price of a thrifted item and find out how much it's going for in store. I paid $6 for the boots and online they average about $70. Forget after Christmas sales, the thrift store is where the real deals are! Do you google your thrift merchandise? Did you find amazing after Christmas deals? Cuuuute! Love the coat and I'm totally digging faux fur nowadays. And the boots are totally worth the hassle. Love the coat! I just found my very first fux fur at a thrift store for 10.00. That was my gift to myself for Christmas! Here's wishing you a Happy 2012! I do google and Ebay my thrift finds. Found a Tory Burch sweater the other day. Googled and its on clearance for $165 regulary $215 I was winning with that at $4.74. I love finding those type of finds. Love that coat. @DaenelT thank you. I'm digging the faux fur too. I saw a cute coat yesterday at the thrift store but it was $25 and would have to be cleaned. @Chandra thank you! oooh I can't wait to see your faux fur! I'm digging it right now. @Mimi me too! I love sharing the price I paid too. Finding those gems are exhilarating! I need to start thrifting. Teaaaccchhhh mmmmeeee. 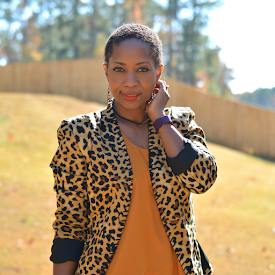 I love the printed tunic and bright blazer together, lovely combo. I wish I could find a coat like that, it looks so luxurious! @Tiff grab $20 and let's go. Thrifting is so much fun. @Nicole thank you. I hardly ever find quality vintage pieces anymore. it has really good "bones". oooh i love those boots!!! we would love for you to link up with us on sunday "sunday best". we need some help with ideas on things to wear to church, so any skirts or dresses you would like to share with us would be great! hope to see you sunday! I'm a huge fan of your blazer and your coat. Gorgeous! I also live in the windy city and love to thrift. Do you mind sharing where you thrift? @Anonymous I go all over but frequent unique on Sheridan, village discount outlet on Clark, and salvation army on Devon. Happy thrifting! @Marie, Chelsea, Buff thank you. I'll stop by on Sunday! Following now. @MARLEY SIMONE thank you. I love your style and your blog!